Honda is facing some tough headwinds, there might be some emissions issues in Porsche Land, General Motors is investing in Brazil and more in The Morning Shift for February 1, 2019. RIP profits at Honda. More seriously, this is somewhat surprising, since all of Honda’s current offerings are very good and a return to form across the board, though apparently not good enough in the age of declining sedan sales. The Civic and Accord have seemed unstoppable for years, but all good things eventually come to an end. Even with strong-selling products like the CR-V, Honda still reported a tough year in 2018. Operating profit dropped to 170.1 billion yen ($1.54 billion) in the fiscal third quarter ended Dec. 31, Honda said on Friday. Net income plunged 71 percent to 168.2 billion yen ($1.53 billion) in the October-December period. Revenue advanced 0.4 percent to 3.97 trillion yen ($36.01 billion), as worldwide sales increased 4.8 percent to 1.41 million vehicles in the three-month period. 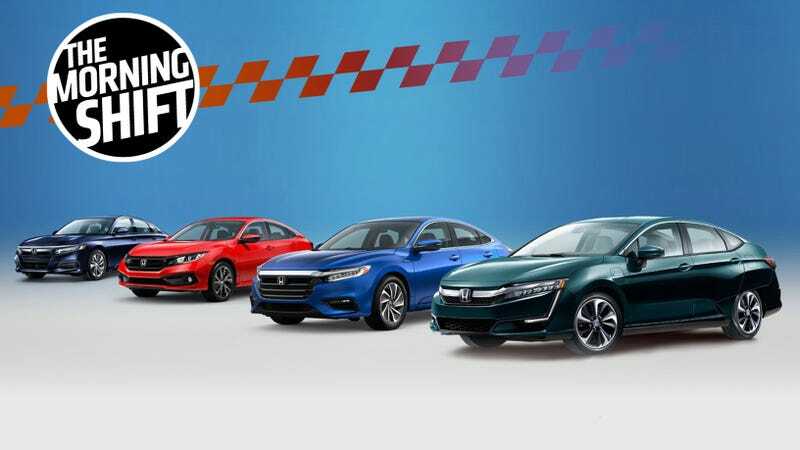 Results retreated on narrowing margins as customers rush away from the sedan segment where Honda is traditionally strong with the Civic and Accord sedans. You people, these days, insist on buying massive trucks and SUVs, but Automotive News says even that part of Honda’s business is lagging. Honda splashed out incentives to sell down the outgoing generation of the CR-V crossover, Executive Vice President Seiji Kuraishi said while outlining results. Honda said it also changed its accounting method for incentives which caused an on-paper increase. Warranty costs climbed as the company recalled the CR-V to fix and engine problem. There was also just some plain bad luck, after a Honda plant in Mexico was flooded because of torrential rain, halting full production. But while Honda for now is not so great, never forget that most every automaker not named Tesla is hugely profitable these days. Honda expects to net $7.1 billion in profits for the fiscal year ending March 31. Maybe the Passport will help. Meanwhile, Honda is trying to build as many cars as it can in the United Kingdom ahead of Britain’s split with the European Union. Brexit is currently somewhat of a slow-moving disaster, but Honda’s not taking any chances. The Japanese automaker, which produces the Civic hatchback model at its factory in Swindon, southwest England, may face possible supply chain, production and distribution issues if Britain’s borders are disrupted from March 29, when the country is due to leave the EU. “To avoid any possible disruptions at the end of March ... we’re making a number of preparations including front-loading some production to ship or step up inventories,” Honda Chief Operating Officer Seiji Kuraishi told reporters in Tokyo. Carmakers in Britain have warned that their factories, which rely on the constant delivery of parts to enter production cycles, would be severely impaired if Britain leaves without a trade deal, forcing the need for customs checks at borders. Brexit has been an utter disaster for the U.K., much like President Trump’s trade war has been for the U.S., but so far its effects have mostly been theoretical. The U.K., for now, remains in the E.U. and still enjoys the trade benefits of that relationship. Honda’s moves, though, show how industry Brexit is affecting industry even in the absence of a long-term Brexit plan, as the British government struggles to find one. GM has been reshaping its global operations, leaving Europe entirely and reconsidering what it’s doing in South Korea. In Brazil, meanwhile, it is apparently there to say, despite losing a ton of money. Automaker General Motors Co is in talks to invest 9 billion reais ($2.5 billion) in the Brazilian state of Sao Paulo over the next three years in return for tax incentives, newspaper Valor Economico reported on Friday. GM has in recent weeks warned its employees in Brazil that “sacrifices” would be necessary for the company to return to profit in the country, raising concerns about layoffs or shuttered assembly lines. Last month, the carmaker told public officials and unions it was in talks with Sao Paulo state about tax incentives. Valor reported that GM would invest in its product line until 2022, and then the following year, the company would start to enjoy tax rebates. Valor, which also reported that GM’s losses in Brazil last year totaled 1 billion reais despite being the country’s market leader, did not specify the exact amount GM would expect to generate in tax incentives. Making cars is hard! And it’s no wonder that aside from Tesla, which has had plenty of headaches getting up to speed, there haven’t been any successful automaker startups in the U.S. in decades. That’s according to Der Spiegel, via Reuters, which says that emissions data for the model years 2016 and 2017 might not be any good. German automakers have never had an issue with this historically. “Porsche has identified issues in connection with individual roll-out tests,” Porsche said in a statement on Thursday. The specific case involves deviations in the measurement of wind resistance values and the corresponding information reported to regulators, the company said. “The company is continuing its internal investigations in close consultation with the authorities,” Porsche said, adding that the problem is not related to engine management software and does not affect vehicle safety. I am sure this is the last thing the Volkswagen Group wants to deal with. It is doubling down on its alliance with Nissan and extremely cool on the idea of linking up with Renault on any kind of permanent basis. This all comes in the wake of Carlos Ghosn’s arrest, and the continuing fallout. Osamu Masuko, CEO of the three-way alliance’s junior carmaker, said a holding company isn’t even an option. The paramount priority for the group should be independence and mutual respect. Maintaining that balance would be difficult under a holding party, he said. Masuko’s sentiments echo those of leadership at Nissan Motor Co., which took a controlling stake in Mitsubishi in 2016 to bring it into the Franco-Japanese alliance. Mitsu is an increasingly strange company, though I hope they get their act together long term. It’d be nice to see that happen. Neutral: Will We Still Have an Accord or Civic in 20 Years? I think yes, as someone who lived through the 2008 recession, when everyone rediscovered that cars that get decent gas mileage are good. But, who knows. It’ll probably be electric in any case.